I can’t wait to bake up a batch of these gluten free pumpkin scones for Thanksgiving week for my mother-in-law. She has celiacs so I like to bake her a special treat when she visits. However, this easy pumpkin scone recipe is so moist and full of flavor that anyone who’s not gluten free will love it. So treat your coworkers at the office or the staff at the teacher appreciation breakfast! After all, this time of year who doesn’t love the combination of pumpkin and chocolate? 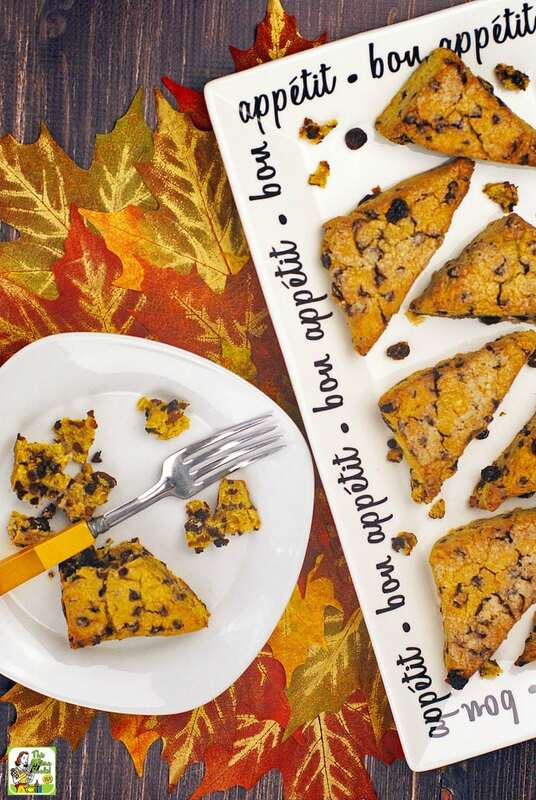 Plus the raisins give these pumpkin chocolate chip scones a nice chewiness! With the holidays coming up, I wanted to cut back on the sugar as much as possible, so I used monk fruit sweetener instead of sugar in the easy pumpkin scones dough. However, I used Bob's Red Mill Simply Sweet Decorative Sparkling Sugar on outside of the scones, for the look and texture. You can eliminate the decorative sugar if you want to make the scones completely sugar free. To make the Gluten Free Pumpkin Scones dairy free, I used a vegan buttery spread and unsweetened coconut milk. Additionally, I used Enjoy Life Semi-Sweet Chocolate Mini Chips, which are dairy free and gluten free. As we come closer to the holidays, you may want to substitute dried cranberries or cherries for the raisins. Adding some diced candied ginger would be delicious, too! To successfully make these pumpkin chocolate chip scones, it’s best if you have a pastry blender and a bench scraper on hand. Believe me, having the right kitchen tools makes things so much easier! Pastry blenders are a must have kitchen tool when making biscuits, pie crust, pizza dough, scones, and pastries. A pastry blender works much better than using a fork or potato masher when combining butter and flour. And remember, pastry blenders aren’t just for baking. Some people like to use them for chopping up fruit and soft vegetables, mashing up baby food, and making salsa and guacamole. I bought Rachael Ray’s Bench Scraper just to make this Gluten Free Pumpkin Scones recipe. Since then I’ve found it handy for scooping up veggies, herbs and meat that I’ve been chopping up on my cutting boards. It’s become one of my favorite kitchen tools! In a large bowl, using the pastry blender, mix together the gluten free flour, monk fruit, baking powder, salt, cinnamon, allspice, nutmeg, ginger, and cloves. Cut the butter spread into small pieces and add it to the bowl. Use the pastry blender to mix the buttery spread into the dry ingredients. Blend until you have pea sized pieces. Using your hands, mix in the chocolate chips and raisins. Make sure to break up any clumps of raisins. In a small bowl whisk together the pumpkin, eggs, and1 teaspoon of the vanilla. Add this to the dry and mix until just combined. Then use your hands to lightly knead the dough together into a ball. Divide the dough in half and place one half on a parchment lined baking sheet. Shape the dough into a long rectangle with greased or floured hands. Taking your bench scraper, divide the rectangle into three squares. Then use the bench scraper to cut each square diagonally into two triangles. Gently move the triangles away from each other. Repeat with the other half of the dough on a second baking sheet. In a small bowl, combine the coconut milk and 1 teaspoon of vanilla. Liberally brush the top of each scone with the mixture. Then generously sprinkle with Sugar in the Raw. Place the baking sheets and scones in the freezer for 30 minutes. Preheat the oven to 425 degrees F at this time. Bake the scones for 20-25 minutes or until golden brown. Cool slightly on a wire rack before eating. Originally published on October 13, 2014. Updated with new photos and information. Next post Best Pumpkin Bread Pudding Ever! Great flavors! Visiting from SRC B! 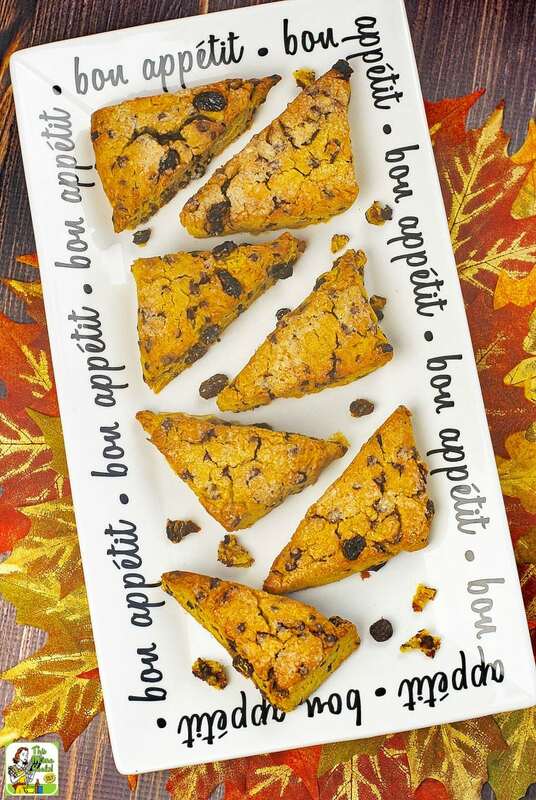 We just love scones and your Pumpkin Chocolate Raisin Scones look awesome! It’s fun cooking with you in the SRC! Ha, ha, I know, right? I would never know that those were gluten free just by looking at them. I just love how golden topped they are. Just biting into one of them would be a delight. We’ve been eating them for breakfast all week. It’s been a real treat! They look great! I love how you made them healthier than traditional scones. Great SRC choice! These look great! Love the healthy changes and the suggestions to add cranberries and ginger for the holiday season!